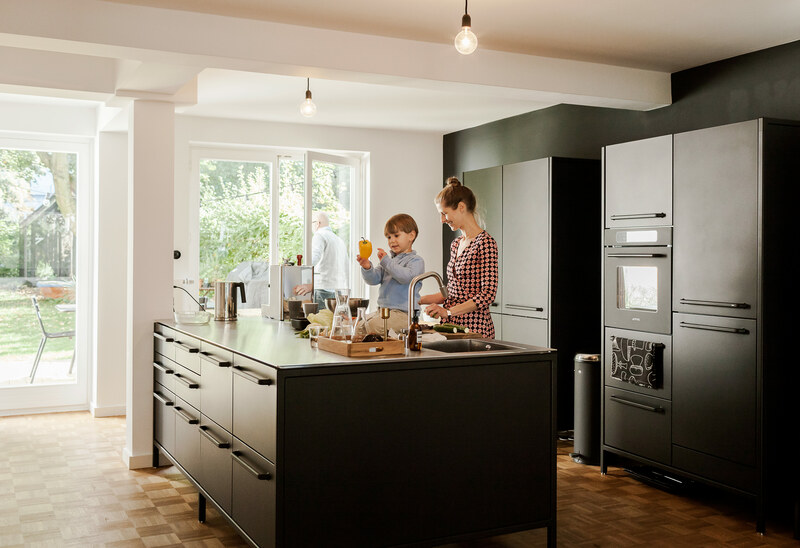 For their kitchen, Fabian and Dorothee Heine selected a steel countertop to contrast the matte-black island and cabinets from Vipp. At mealtimes, the family gathers at a Bigfoot table from e15, which is surrounded by vintage Eames shell chairs. The home is a showcase for the modern furnishings the residents have collected over the years. Vintage armchairs by Florence Knoll and a PA05 Leila coffee table from e15 outfit the living room. A Colour Carpet by Scholten & Baijings for HAY defines the play area in Morten’s bedroom. Fabian plays with Morten in the yard, which features a spacious lawn and a greenhouse. 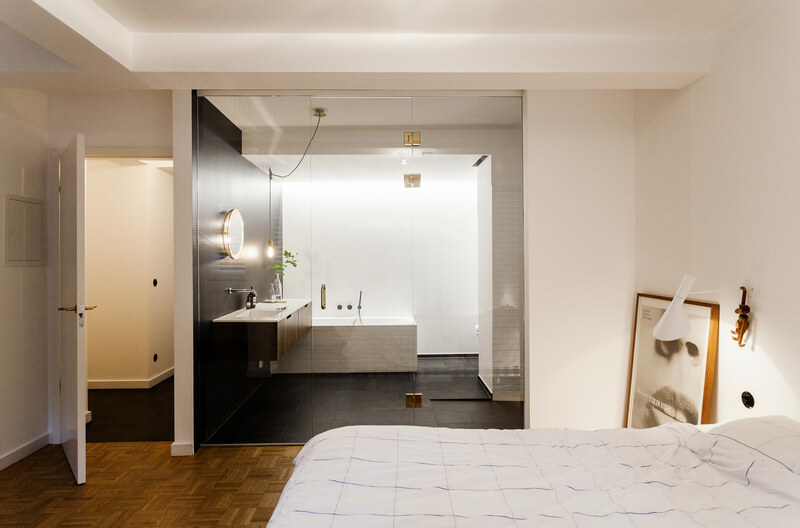 A glass wall separates the master bathroom from the bedroom, a design movethe couple had seen in hotels. A Universal vanity in acacia wood from Boffi was chosen to add some warmth, along with a stone floor with radiant heating. The mirror is a vintage design by Mathieu Matégot. 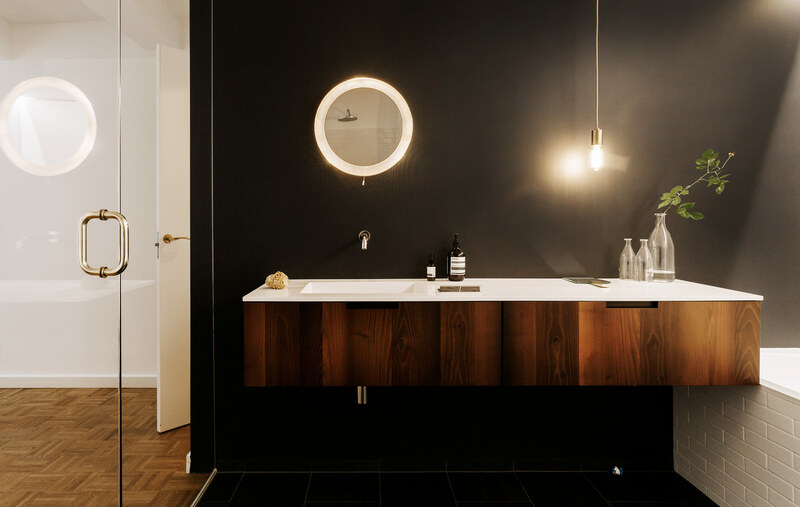 In the master bedroom, a Hästens bed is paired with an AJ sconce by Arne Jacobsen for Louis Poulsen. A vintage poster for the 1968 French film Stolen Kisses is a nod to Fabian’s career in advertising, as well as the time period in which the apartment was built. Fixtures by Naoto Fukasawa for Aboutwater, a collaboration between Boffi and Fantini, adorn the Villeroy & Boch tub. A small office for Dorothee, furnished with a desk by German architect Egon Eiermann and an Eames chair, overlooks the street. But the pair, warned by friends about the hidden costs associated with renovation, began to fear their budget wouldn’t allow for the Vipp model, which retails for $60,000, including appliances. “It was the last thing we ordered, because we wanted to make sure we could afford it,” Fabian says. 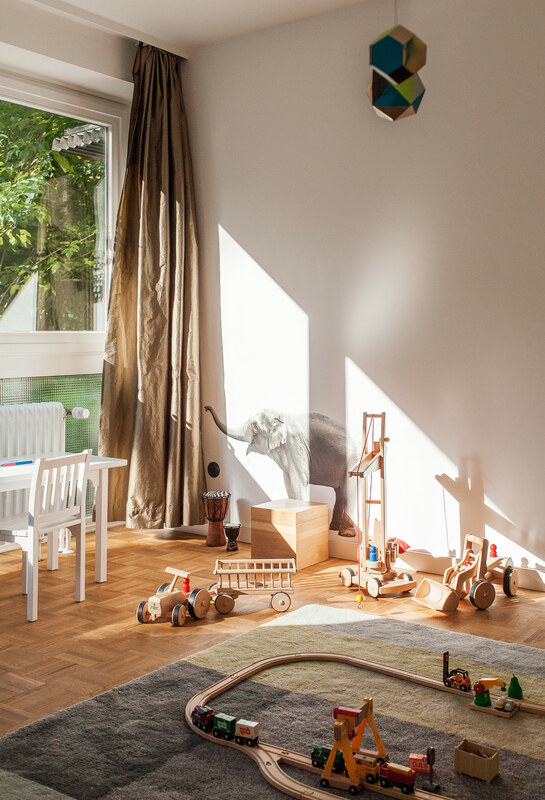 In fact, when he and Dorothee, pregnant with their son, Morten, moved into their new home, they had no kitchen at all—only remnants of an IKEA setup, left by the previous owner. By using their cardboard moving boxes to form the basic shape of the island and appliances, they visualized how the Vipp system would fit into the space. Finally, they pulled the trigger and placed the finishing touch on their apartment. With a handful of design-minded business operations in Hamburg, Fabian and Dorothee have established themselves as leaders in the city’s creative scene. Fabian is the co-owner of Erste Liebe Film, a commercial film company, and Dorothee runs a bicycle shop for urban commuters called Two Wheels Good. Their aesthetic, which favors neutral colors and raw materials, has seen particular success at Erste Liebe Bar, a café that Fabian opened 15 years ago in the city center that’s become a popular meeting spot for architects and photographers. Tempted at one point to move into an enclave of 1970s-era homes in the suburbs, Fabian and Dorothee eventually decided that living in the heart of Hamburg was more important to them. 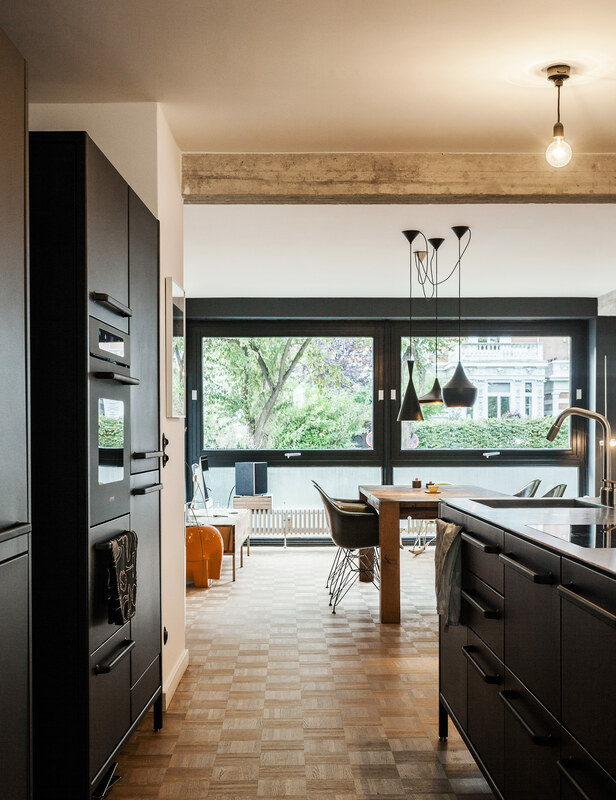 Just two streets away from their previous rental, in the Harvestehude neighborhood, a 1967 apartment building seemed like the perfect opportunity. Two town houses, seriously damaged by a bomb in WWII, sat in limbo for decades before an architect demolished them to build a four-story multi-unit building. The structure had two bonuses: a spacious garden out back—a rare find in the city center—and a garage, both features that Dorothee and Fabian had on their respective wish lists. The Heines purchased two units on the ground floor and combined them into one, creating an approximately 1,500-square-foot home. By looking at historical plans for the space at the city’s building department, they discovered that their floor was once used as an office. “It only had concrete columns and was planned as an open space,” Fabian says. “We were always planning to connect the apartments, but it was a nice surprise to see that we were able to knock down walls.” After consulting an architect friend, the couple decided to create an open-plan kitchen, dining, and living area, thereby giving the apartment the spacious “bungalow” feeling Fabian sought. The space that was once a separate apartment now comprises two bedrooms and a master bathroom. The open-plan arrangement put extra pressure on the kitchen to match the residents’ visual standards. “When you enter the place, it is the first thing that you run into,” Fabian says. “The kitchen had to be a piece of furniture.” And Vipp, the 77-year-old company that became famous for its iconic pedal trash can before venturing into kitchens and other tools for the home, had created the perfect fit: The couple’s chosen kitchen-system’s black island and cabinets, elevated on legs for a feeling of lightness, could pass for sideboards and wardrobes. Though the Heines initially wanted a gas cooktop, they chose induction, thinking it would be safer for their son and would better integrate into the sleek steel worktop.